View of “The Making of Americans,” 2011. Presented as a concise history of modern art’s development through the mid-twentieth century, “The Making of Americans” offers all the elements of a serious, scholarly exhibition: tasteful but crowded hangings, vintage catalogues under glass, televisions playing documentary footage, even a period room loosely reconstructing Gertrude and Leo Stein’s Parisian salon. Indeed, the Berlin-based Museum of American Art, which organized the show with the James Gallery and the Salon de Fleurus in New York, frames its mission as an ethnographic investigation into the legacy of the Museum of Modern Art during the tenure of its founding director, Alfred H. Barr Jr., who in the 1930s formulated the fundamental narrative of European modernism—notably through his famous genealogical diagram—and exported it, with its New World successor, Abstract Expressionism, back to the Continent twenty years later. 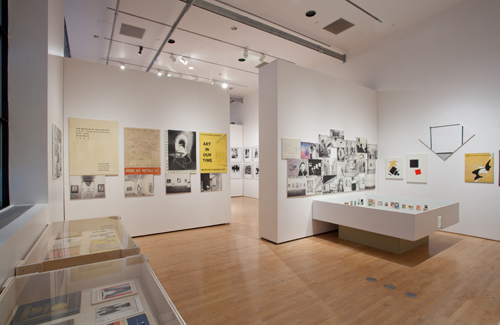 After covering the Steins’ salon and the museum’s first decade (1929–39), “Making” picks up ten years later—largely skipping over (but drawing from) the period covered by Serge Guilbaut’s revisionist 1983 study, How New York Stole the Idea of Modern Art, which claimed the US government sought international supremacy in the early cold war through both economic muscle and cultural might. Opening at the tail end of “Abstract Expressionism New York,” MoMA’s narrative-reifying opus, “Making” is a pesky, indispensable reminder that even though art history is written by the victors, it doesn’t evolve without persistent, healthy contestation.